Many people after completing their chartered accountancy course decide to start their own firm rather than work as an employee. In the beginning, all professionals dream of being ranked among the best CA firms in India. As they start running the operations, they realize how hard it is to realize the dream. They have numerous challenges facing them like competition from top CA firms and retaining efficient staff members. The diligent nature of their work where even a simple error can prove costly to the client adds to the pressure. We would like to relieve some of the pressure by providing answers to some difficult questions that all new CA agency owners face. 1. How Can New Partners Be Found For The Agency? A chartered accountant after working for a few years at a company ventured to start her own CA firm in Gurgaon. After some time she wanted to add new members to the firm but did not know how to go about it. The biggest hurdle in finding new partners is the inability to pay a remuneration. This problem can be avoided by creating a revenue-sharing model which will be found attractive by potential partners. The plan must clearly outline the percentage or share of the earned revenue which will be kept by each individual. There are various factors that must be kept in mind while devising the model like the partner who brought a client getting a bigger share from the revenue for that project. 2. Is There Any Method Other Than Referrals To Generate New Clients? One of the biggest problems that new agency owners face is how to attract clients without paying any referral commission. Most new CAs are dependent on referrals from their peers or existing clients for getting new business. Paying commission can be hard for an owner who has just started out and a possible way out can be by building an image of a knowledgeable and efficient professional. Start posting useful and incisive content related to your field on virtual forums of the domain. Social networks like Facebook and Linkedin can also be used for the purpose. Once people start recognizing you as an authority in the field they will start approaching you for assistance. 3. How Can Less Time Be Spent In Meetings? The top CA firms in India reached their current position by providing high-quality service and managing time efficiently. New owners have to spend a lot of time in meetings with clients and their associates. They feel that they do not have time for expanding their business or brushing up their skills. Technology can be of immense help in this regard. They must install a workload management software to efficiently track all the projects and the time spent on them. Using internet-based technical communication solutions like Skype can be used for conducting meetings which will again save time which would have been lost in commuting to client’s location. 4. How Can Networking Skills Be Improved? The best CA firms in India make it a point to hire individuals with excellent networking skills. This is helpful in not only bringing in new business but also make connections in government offices and other agencies. Most of their work gets smoothly conducted because of knowing the right individual at the right office. New owners must shed their inhibitions and start attending seminars and other events where they can meet their peers. They must also attend social events where they can come in contact with influential people who can help them in their work. 5. How Can Employees Be Retained? People like the Gurgaon-based owner of the new CA firm in Delhi NCR are constrained by their inability to pay a high salary for hiring the brightest minds in the field. The top CA companies in India with their deep pockets corner the cream of the talent. 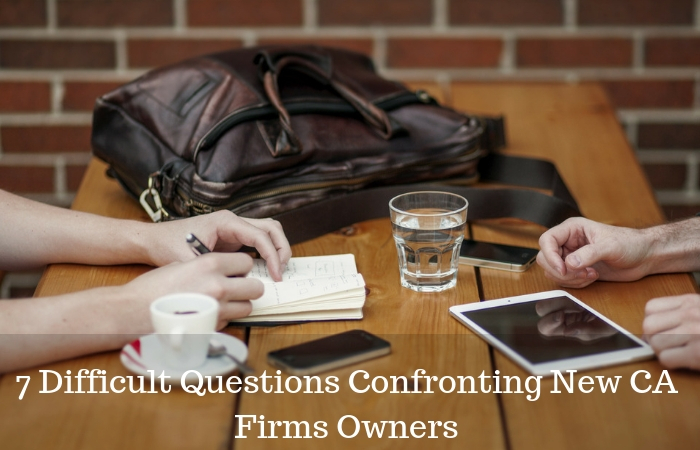 Owners try to assess an individual’s knowledge and skill level during an interview. They must use the interaction to learn about the candidate’s aspirations and thinking process. Offer partnership rather than a fixed salary to a person who you feel will add value to the firm. 6. How To Get Clients To Pay On Time? Another vital question that most people need a solution for is how to get clients to make their payments punctually. They fear that insisting on payment may put off the client and they will lose business. One of the key tips that all CAs must follow is to ask for a part of the whole fees as advance before starting the work. Create an email ID for your accounts section and send reminders from that address. This will solve the problem of directly approaching the client for dues. Professionals must also devise properly-worded contracts and start work only after both parties have agreed to the listed terms and conditions. 7. How Can The Business Be Expanded To Other Locations? The best way to grow a business is to start providing services at multiple locations. Large economies have more than one business centers with a requirement of professional accountants. New owners are hindered by lack of resources in expanding their operations to other cities. Their networking skills can be of great help in this regard. They can find another professional or investor who will bear the expenses of starting operations in a new location while they handle the management. The best CA firms in India have reached their present position after finding their own solutions to the above-mentioned questions. Aspiring CA firms owners can take help from the suggestions given here and try to devise their own solutions for the problems.